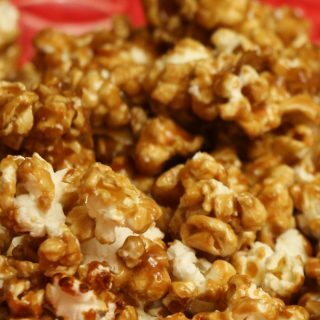 The best Caramel Popcorn recipe! You will be thankful that it is easy to make because it disappears fast and leaves everyone asking for more! Hi, I’m Hannah, and Laureen is basically one of my “aunties”. I married her son’s childhood best friend and she has recruited me to contribute some guest blog post. 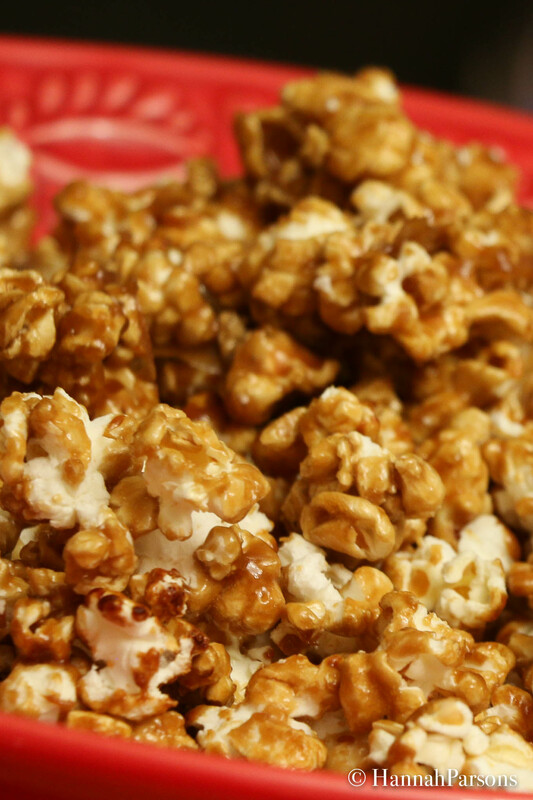 With the Christmas season in full swing, it seemed appropriate to share a holiday legacy that has been passed down for 3 generations and is always a hit… Caramel Popcorn. Aside from being dangerously addictive, this recipe is simple and great for even non-bakers. It also makes a great, inexpensive gift for friends or coworkers – just put it in Christmassy cellophane bags, tie a bow around the bag, and voila! a delicious, easy gift for a lot of people! When making this recipe it is important that the mixture foams up after adding the baking soda. It will lighten to a creamy caramel colour. 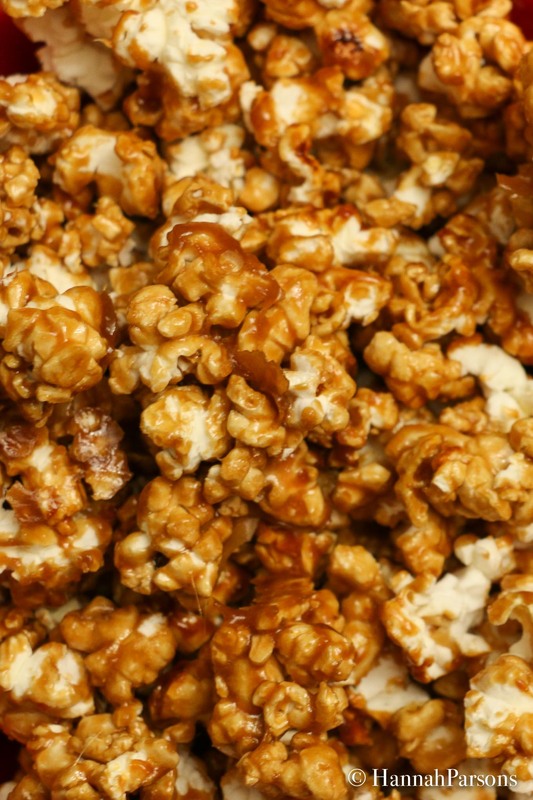 The best caramel popcorn recipe - you’ll be thankful it’s easy to make because it disappears fast and leaves everyone asking for more! Pop the popping corn kernels and set aside in a large bowl(s). (It’s a lot of popcorn, so this may need to be done in batches depending what you use to pop the corn). 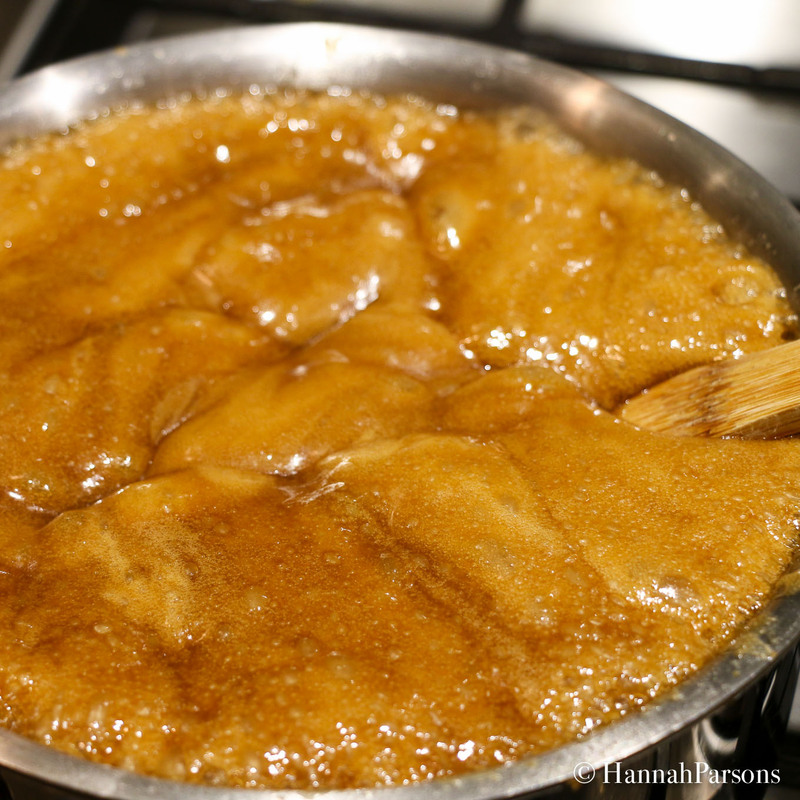 Combine brown sugar, white corn syrup, butter, and salt in a saucepan over medium heat. Bring to a boil and don’t stir for 5 minutes. Remove from heat and stir in baking soda until it foams up significantly. 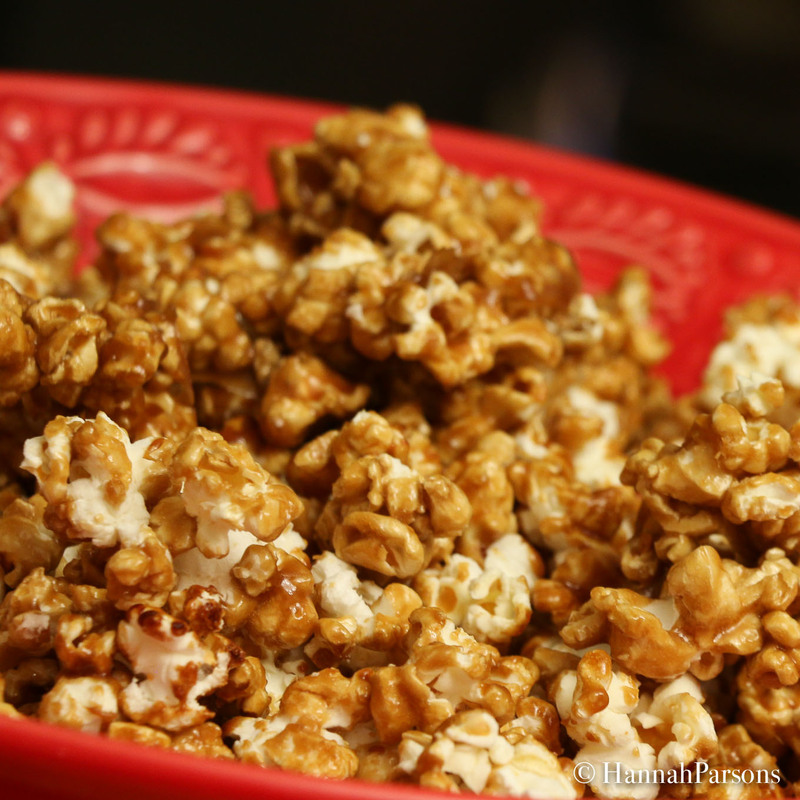 Pour the mixture over the popped corn in the large bowl and stir to combine until evenly coated. Spread on two cookie sheets. Bake at 225 degrees for 36 minutes. Stir the popcorn every 12 minutes during baking time. Remove popcorn from the oven and let cool. Break up and store in ziplocs or airtight containers. 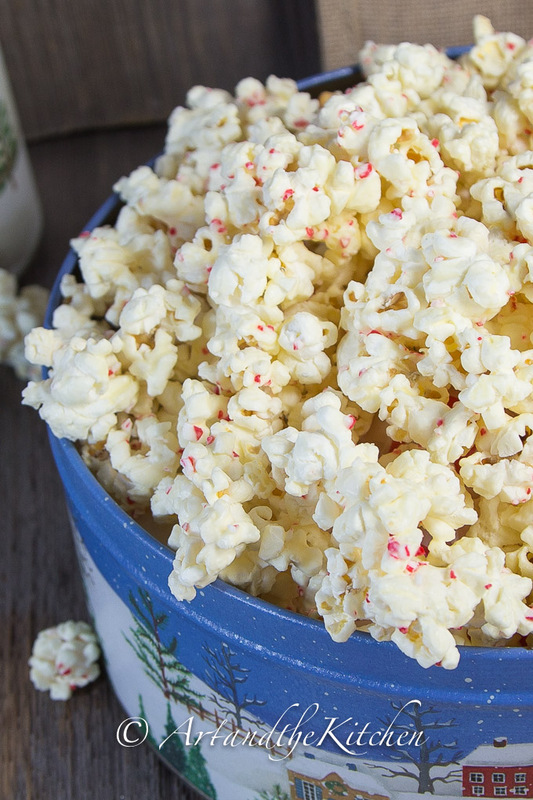 For another great holiday popcorn recipe, try this White Chocolate Candy Cane Popcorn!